The Jagdpanzer IV is a German tier 6 tank destroyer. El carro medio Pz. IV sirvió como la base de muchos vehículos, incluyendo cazacarros. A finales de 1944, se preparó una versión del cañón PaK 42 L/70 de 75 mm para esta base. La nueva variante del vehículo se designó JagdPzIV/70. Desde agosto de 1944 hasta marzo de 1945 la compañía Nibelungenwerke fabricó 278 vehículos de este tipo. Unlike most other tank destroyers of its tier, the Jagdpanzer IV is not optimised for sniping at long distances. Its guns simply do not have the penetration for that purpose. What it does have is a ferocious rate-of-fire with its two top guns, excellent mobility, and a low and stealthy profile. It also has fairly decent frontal armor for its tier as an added bonus. The Jagdpanzer IV leads to the Jagdpanther. Slow shell velocity on the 8,8, sniping from long distances at moving targets is exceedingly difficult. The Jagdpanzer IV does not play like any of the other Tier 6 tank destroyers. While most of the other tank destroyers of its tier feature high penetration guns, the Jagdpanzer IV does not get any better penetration than its predecessor, the StuG III Ausf. 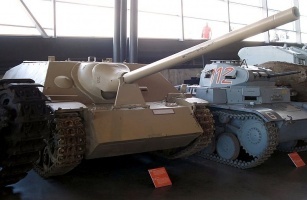 G. There are two viable options: the 7,5 cm StuK 42 L/70 will be familiar to those used to the StuG III G. It is quite accurate, and fires even faster on the Jagdpanzer IV. The other gun is the 8,8 cm PaK L/56. This gun is essentially the same as that used by the VK 36.01 (H), but fires even faster. With an exceptional base DPM of over 2400 (most others of its tier do not even reach 2000), a reload of under 6 seconds and a very respectable 220 damage per shot, this is slightly offset by the mediocre penetration of only 145 mm (tier 6 medium level). Both of these guns have outstanding aim times, allowing the Jagdpanzer IV to shift targets and aim quickly after coming to a brief stop. Like many tank destroyers, the frontal armour of the Jagdpanzer IV is quite decent for its tier, 80 mm thick and fairly well-sloped, and will protect it against most lower tiers, but its flanks are much thinner. It also has an outstanding camouflage factor and a low profile, making it very easy to hide on the battlefield in order to ambush enemy tanks or snipe undetected. The overall mobility is quite good, although the top speed and reverse speed are fairly low. The Jagdpanzer IV turns very well, and also accelerates well. Given these traits, the Jagdpanzer IV with the 8,8 cm excels very much as an assault gun, not a sniper. Instead of sitting on a hill with this tank, use your speed and mobility to keep up with friendly tanks and provide them with supporting fire to help their advance. Only when you know you will be able to penetrate enemies from your position should you stay stationary. The fast aiming gun allows you to minimize your time standing still. Another key element of being an ambush DPM tank destroyer is defending losing flanks. 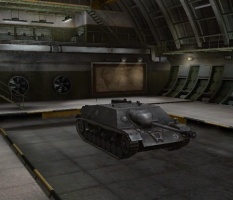 Utilize the tank's mobility to re-position and ambush enemy tanks pushing a flank. This should give you a first strike advantage, and possibly a health advantage, if your allies were able to do something before falling. Few tanks of the same tier can deal with multiple targets and stay nearly invisible to the enemy. Using the L/70, one may take a more traditional role, and play the tank to its biggest strengths, without getting dangerously close to the front line. With the high accuracy of the L/70, one may target specific areas of tanks, such as the tracks - even at range. This tactic will allow a player to remain at least 100 m away from the enemy at all times - easily done in combination with mobility. 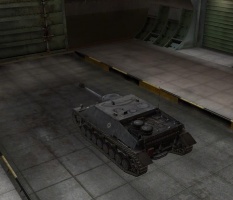 Additionally, the Jagdpanzer has a very good camo value and when properly hidden (remaining far enough behind bushes that any shot will not break camouflage) can lay on the DPM from afar without any risk of return fire. Using the L/70 and a gun rammer, the Jagdpanzer IV becomes almost like a tier 6 E 25, with a very fast firing gun, good speed and camo values. Don't be afraid to trade with the enemy, even if they have big guns. With either gun, but especially the L/70 (due to the lower frequency of unfortunate bounces and weird misses), you can take hits to your decently large HP pool/sloped armor and you will have higher DPM than any enemy you face - letting you win fights through sheer attrition. This is something the StuG III couldn't do. However, remember to only resort to this tactic when absolutely needed, as in self defense situations. Otherwise, staying hidden is key. The Jagdpanzer has a great gun, that averages at 230 alpha, so just keep wiggling to increase the chance of a >70 degree bounce or a hit to the gun mantlet. 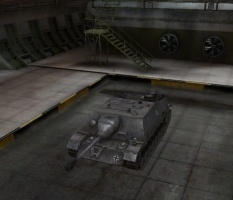 You can also try and outflank the enemy, by using the great stealth, speed, and camo rating on this tank. Some APCR is recommended for both guns to use against the Tier 8s that Tier 6s will face from time-to-time, although they are still not enough for penetrating most Tier 8s from head-on. Nothing can be mounted with the stock suspension, so either research the upgrade first or use the enhanced suspension equipment. 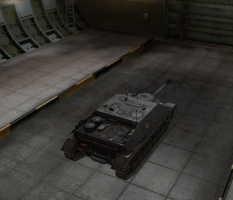 The L/70, engines, and FuG 7 radio all carry over from the StuG III G.
Research the 8,8 cm PaK L/56 before moving on to the Jagdpanther, since otherwise it must be researched on the Jagdpanther anyway. The Jagdpanzer IV, Sd.Kfz. 162, was a tank-destroyer based on the Panzer IV chassis built in three main variants. As one of the casemate-style turretless Jagdpanzer ("Hunting tank") designs, it was developed against the wishes of Heinz Guderian, the inspector general of the Panzertruppen, as a replacement for the Sturmgeschütz III (StuG III). Guderian objected against the needless, in his eyes, diversion of resources from Panzer IV tank production, as the Stug III and Sturmgeschütz IV were still more than adequate for their role. After the Battle of Stalingrad, in September 1942, the Wehrmacht's arms bureau, the Waffenamt, called for a new standard for assault weapons; 100 mm of armor to the front, 40–50 mm on the sides, wider tracks, ground clearance of 50 cm, top speed of 26 km/h, and the lowest possible firing positions. The new Panzerjager ("tank hunter") design would be armed with the same 7.5 cm gun as fitted to the Panther: the Pak 42 L/70. Initially, a new chassis were planned, but that of the Panzer IV had to be used. Previous efforts to mount bigger guns on smaller chassis resulted in the Marder series as well as StuG IIIs. The Marder series were tall and had open crew compartments. The new design had a low silhouette and completely enclosed fighting compartment. The Jagdpanzer IV used the Panzer IV chassis 7 (known as BW7), but the almost-vertical front hull plate was replaced by sloped armor plates. Internally, the layout was changed to accommodate the new superstructure, moving the fuel tanks and ammunition racks[clarification needed]. Since the Jagdpanzer lacked a turret, the engine which originally powered the Panzer IV's turret could be eliminated. The new superstructure had 80 mm-thick sloped armour, which gives greater armor protection than a vertical armor of 100 mm. To make the manufacturing process as simple as possible, the superstructure was made of large, interlocking plates which were welded together. Armament consisted of a 7.5 cm main gun, originally intended to be the PaK 42 L/70, but shortages meant that for the pre-production and the first production run, different older guns were used: the 7.5 cm PaK 39 L/48. These were shorter and less-powerful than the PaK 42. Installing the much heavier PaK 42 meant that the Jagdpanzer IV was nose heavy, especially with the heavy frontal armor. This made them less mobile and more difficult to operate in rough terrain, leading their crews to nickname them Guderian-Ente "Guderian's duck". To prevent the rubber rims of the roadwheels from being dislocated by the weight of the vehicle, some later versions had steel roadwheels installed on the front. 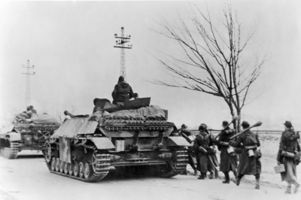 The final prototype of the Jagdpanzer IV was presented in December 1943 and production started in January 1944, with the PaK 39 L/48 armed variant staying in production until November. Production of the PaK 42 L/70 armed variants started in August and continued until March/April 1945. On August 19–22, 1943, after the Battle of Kursk, Hitler received reports that StuG IIIs performed better than Panzer IVs, within certain restraints of how they were deployed. It was thus intended to stop production of the Panzer IV itself at the end of 1944 to concentrate solely on production of the Jagdpanzer IV, but the Panzer IV was in production all the way until the end of the conflict, along with Jagdpanzer IV. Jagdpanzer IV with 7.5 cm PaK 39 L/43: a small number of these were built as the pre-production (0) series. Jagdpanzer IV with 7.5 cm PaK 39 L/48, official name Sturmgeschütz neuer Art mit 7.5 cm PaK L/48 auf Fahrgestell PzKpfw IV. Some 780 or so were produced in 1944. Jagdpanzer IV/70 (V) (Sd.Kfz.162/1) was one of two variants armed with the PaK 42 L/70 gun. Some 940 were built in 1944 and 1945. The (V) stands for the builder, Vomag. Jagdpanzer IV/70 (A) (Sd.Kfz.162/1) was the other PaK 42 L/70 armed Jagdpanzer IV. In order to send Pak 42 L/70-armed vehicles to the front as soon as possible, Hitler ordered an interim solution in July 1944. Alkett, a manufacturer of the StuG III, Alkett, was to immediately produce the Jagdpanzer IV to its own design. These differed in that its superstructure was mounted directly on the original Panzer IV chassis, and as such, lacked the sharp-edged nose of the Vomag variant. It was also taller. Only 278 were built in the period from August 1944 to March 1945. The (A) in the designation came from Alkett. This variant is also known as the Zwischenlosung: in translation, the "intermediate solution". Minor modifications and improvements were made throughout the production runs of all variants, as well as several field improvements, the most common being the addition of armor side-skirts. Originally, the Jagdpanzer IV/48's gun had a muzzle brake installed, but because the gun was so close to the ground, each time it fired, huge dust clouds would rise up and betrayed the vehicle's position, leading many crews to remove the muzzle brake in the field. Later variants dispensed with the muzzle brake. Early L/48 and L/70-armed vehicles had zimmerit applied to the hull to protect against anti-tank grenades, but this was discontinued after about September 1944. 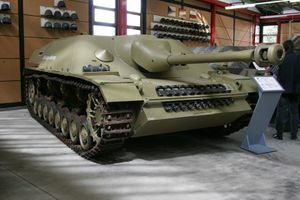 Later vehicles had three return rollers rather than the original four, and adopted the twin vertical exhausts typical of the late Panzer IV series. Some late vehicles also had all-steel road wheels on the first couple of bogies on each side. The Jagdpanzer IV served in the anti-tank sections of Panzer and SS Panzer divisions. They fought in Normandy, the Battle of the Bulge, and on the Eastern Front (WWII). They were very successful tank-destroyers, but performed badly when used out of role as substitutes for tanks or assault guns, as most tank-destroyers were. In the later stages of the war however, they were increasingly used as tank substitutes, because there was often nothing else available. Romania received several Jagdpanzer IV tank-destroyers from the Red Army after the war ended. They were officially known as TAs T4s in the army inventory and were used until 1950. All German armor was scrapped in 1954. One of the more notable Jagdpanzer IV aces was SS-Oberscharführer Roy from the 12th SS Panzerjäger Abteilung of the 12th SS Panzer Division. He was killed by an American sniper while looking out of the hatch of his Jagdpanzer IV on December 17 1944, during the Ardennes Offensive in Belgium. After the war, West Germany continued the Jagdpanzer concept with the Kanonenjagdpanzer, but few other fixed-casemate self-propelled guns were built postwar. Jagdpanzer IV/48 (Sd.Kfz. 162) 0 Serie pre production vehicle on display at the Deutsches Panzermuseum Munster , Germany. German tank destroyer Jagdpanzer IV/70 (V) displayed at the Canadian War Museum in Ottawa, Ontario. Its only primary armaments are the 7,5 cm guns. No historical records of the 8,8 cm Pak L/56 configuration exists. Esta página fue modificada por última vez el 25 oct 2016, a las 12:59.